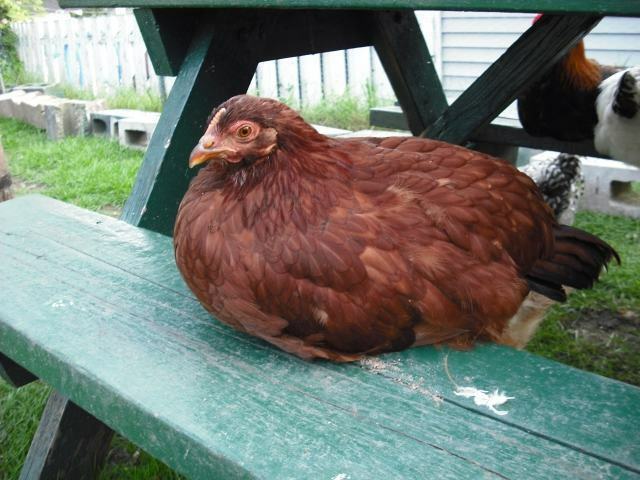 It was built in June 2008 to welcome the original members of our flock, our 9 Bovan Brown ladies, which were a little over 1 year old when we got them. The four main beams are anchored in a big cement bloc shaped like a square donut. My son says that in case of a tornado, we can take cover in the chicken coop! Since we live in the province of Quebec, Canada, it is well insulated and we have a little heater inside for the very cold days. There are windows all around at the top of the back and side walls. These windows and the front door have waterproof flaps that we roll up to let the sun and the fresh air in. We leave the door open during the day, so there is no need for a separate trap door. In winter, we add an insulated extension in front of the door to avoid our ladies to be directly exposed to the freezing wind (you can see it on the second picture, behind the coop). There is no day predators in our neighborhood and our backyard is enclosed all around by fences. At night, our birds have to be protected against the racoons, the only serious threat we have to guard against. Since we added new members to our flock this spring, we now also have a brooder cage, a chicken tractor (that we have now parked behind the main coop), a rooster pen under our house and a small mobile coop & run, that can house a couple hens, but it isn't used in this moment (one of our neighbors is interested to buy it to keep two hens and maybe a rooster!). 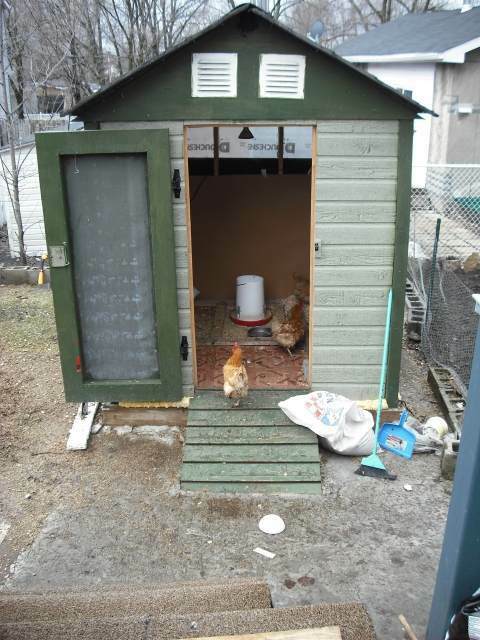 In August 2009, with the arrival of 12 meat chicken, we have added a medium-size coop with its temporary pen. So actually, since we have only 4 out of 9 of our initial group of ladies left, we have 4 two year old hens sleeping in the main coop, 8 twenty week old pullets sleeping in the tractor behind the coop, 1 twenty week old cockerel sleeping in the pen under the house and 12 five week old meat cockerels sleeping in the medium-size coop. We let the crowing cockerel out only at nine in the morning, to avoid disturbing our neighbors. But without further ado, let us present you our dear boy and girls. We will begin with our 4 Bovan Brown ladies. Georgette is now second in the pecking order. She is known for her incredible appetite. She eats anything we throw at her. Sadly, she is losing weight and getting weaker lately. We are afraid that she will finish soon like Beaker, Nikolia and Pamela. Now that you have met our 4 ladies, let us continue with our youngsters. These were hatched on April 2th 2009. 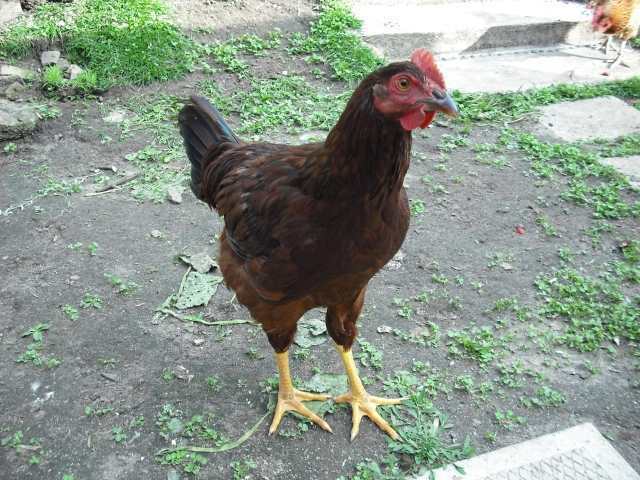 They are pure bred chicken, not commercial hybrids like our ladies. [FONT=comic sans ms,sand]Below, the high school sweethearts, Hera and Zeus (R.I.P.). 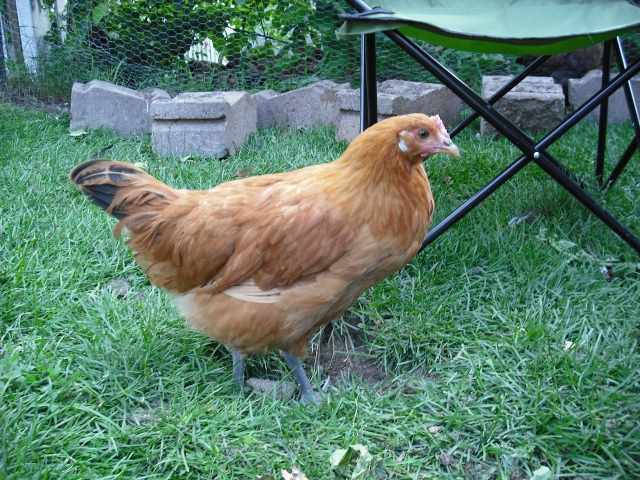 Penelope is our second Rhode Island Red pullet. She is calm and, like her sisters, appreciates the company of Alexander. Below, Che (R.I.P.) and Pache eating side by side. 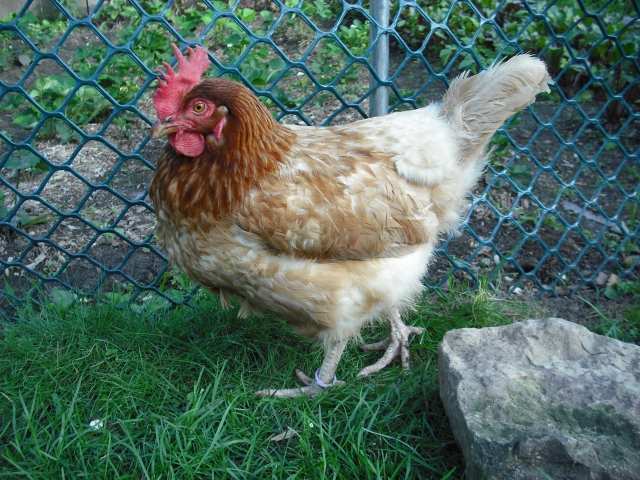 Pamela, second in the pecking order after the deaths of Beaker and Nikolia, has sadly passed away on Friday, the 24th of July 2009. 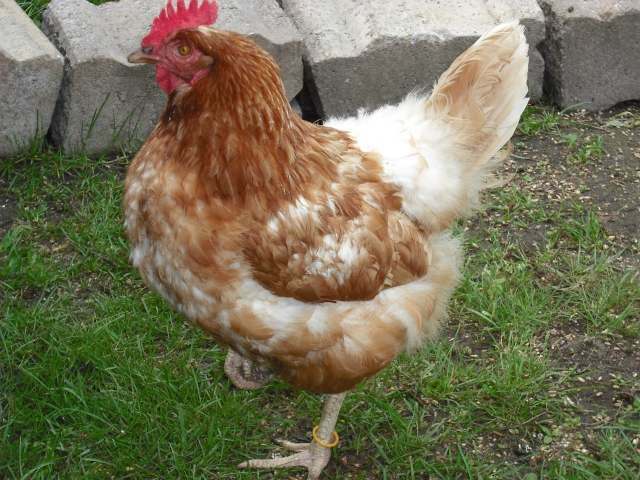 She had lost a lot of feathers since the Winter, mainly because Georgette and her had developed the bad habit of plucking each others' feathers. 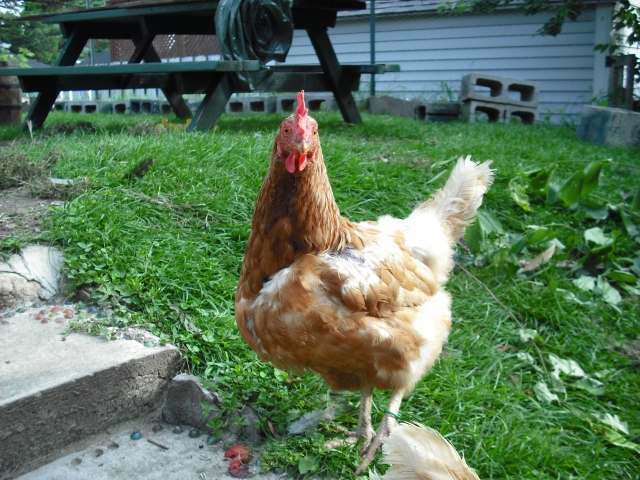 She was known for being the hen obsessed with good table manners, since she was constantly cleaning everyone's beak during the meals. We found her dead in one of the nesting boxes in the afternoon. 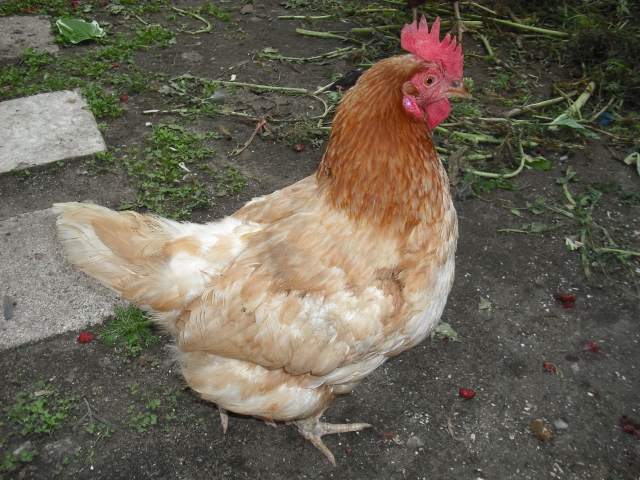 Our post mortem examination confirmed the suspected cause of death: yolk peritonitis, caused by egg inlaying. 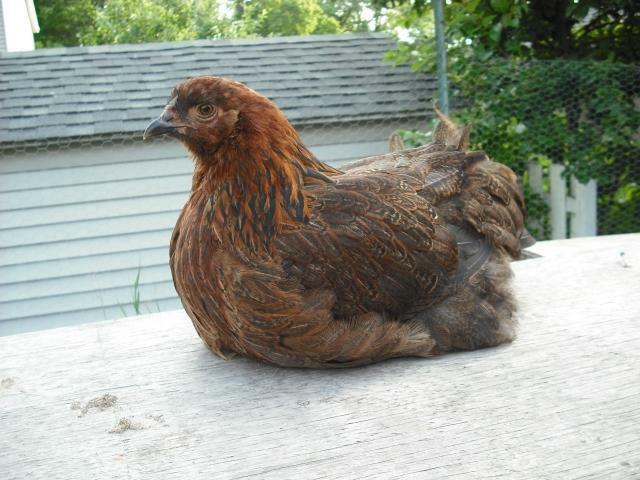 Sadly, it is a frequent condition in commercial hybrid "superlayer" hens aged over 2 years old, for which there is no cure. 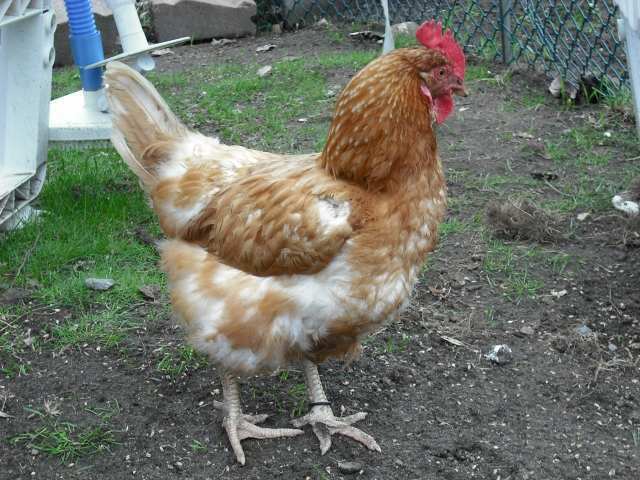 The fact of laying one egg per day without any interruption is just to hard on their reproductive system. We lost Beaker in January and Nikolia in May from the same cause. 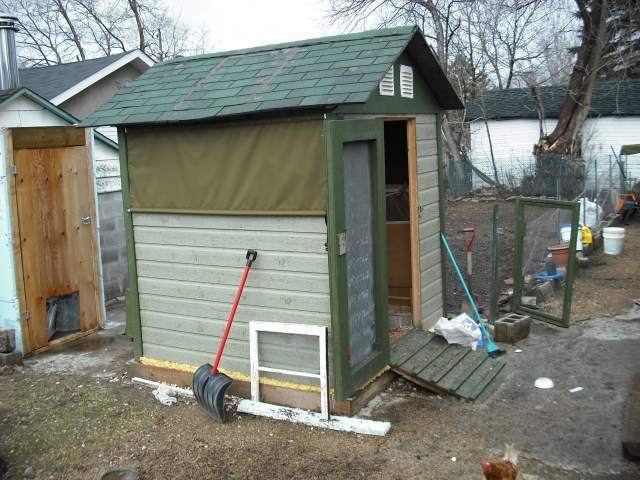 May 2008: Pierre begins the construction of the main chicken coop. 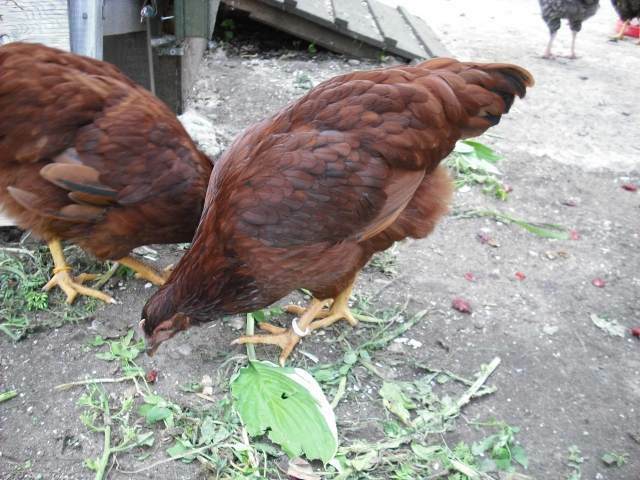 22nd of June 2008: We pick up and bring home our 9 one year old Bovan Brown hens. 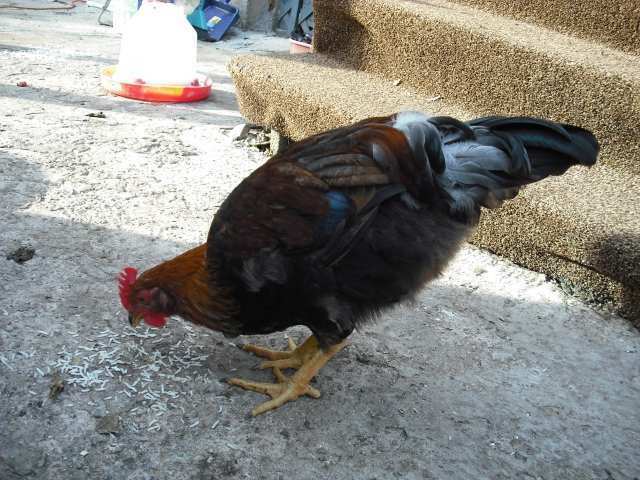 One cold morning of January 2009: Radmila finds Beaker, her favorite hen, dead in the coop. Cause of death: yolk peritonitis. 4th of April 2009: Pierre builds a 2'x3' brooder cage with a heating lamp. 5th of April 2009: We pick up 16 three day old chicks of different pure breeds. 18th of April 2009: Pierre begins the construction of the chicken tractor for the young chicks. 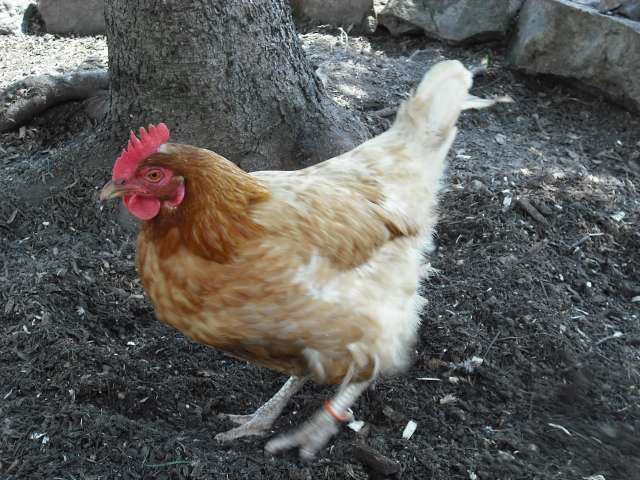 5th of May 2009: We decide to put down Nikolia, who presents all the symptoms of yolk peritonitis. 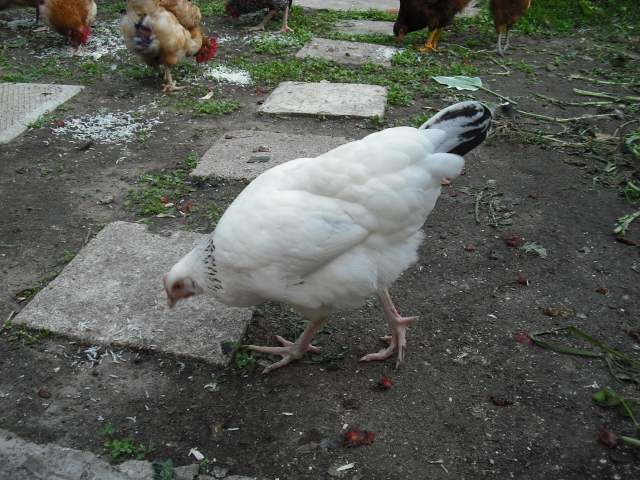 9th of May 2009: We put our 16 five week old chicks outside in the chicken tractor. 24th of May 2009: Pierre builds a mini coop with a mini chicken run. 25th of May 2009: We pick up 4 new seven-week-old chicks - 2 Welsummer & 2 Light Sussex. Their home is the mini coop. 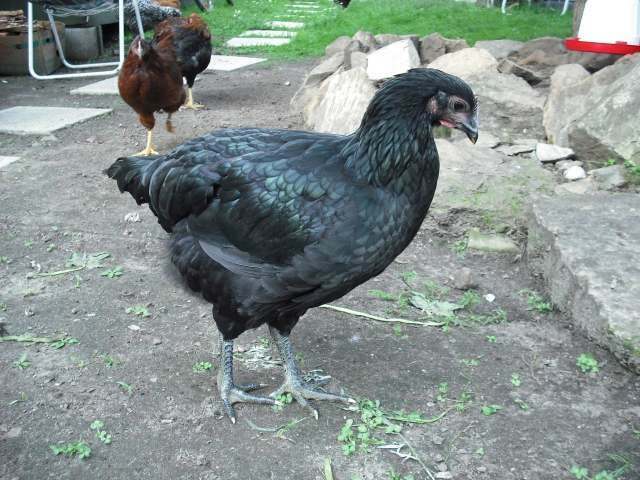 End of May 2009: An unnamed BO chick and Gonzo, a Cuckoo Marans little cockerel, both handicaped, have to be culled. 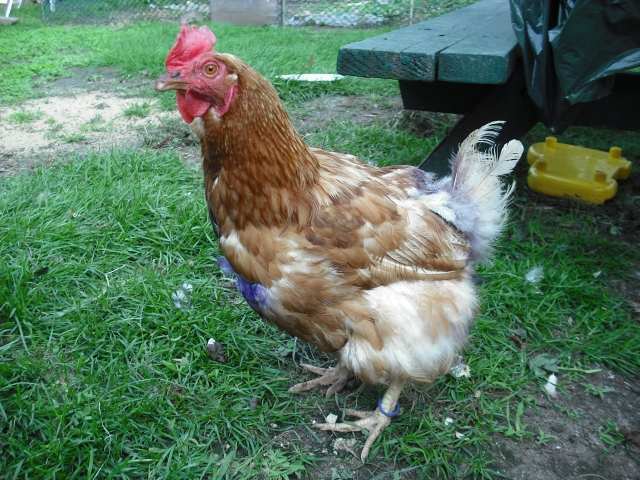 Beginning of June 2009: We take the difficult decision of putting down Suzie, who wouldn't stop her vicious attacks on the young chicken. 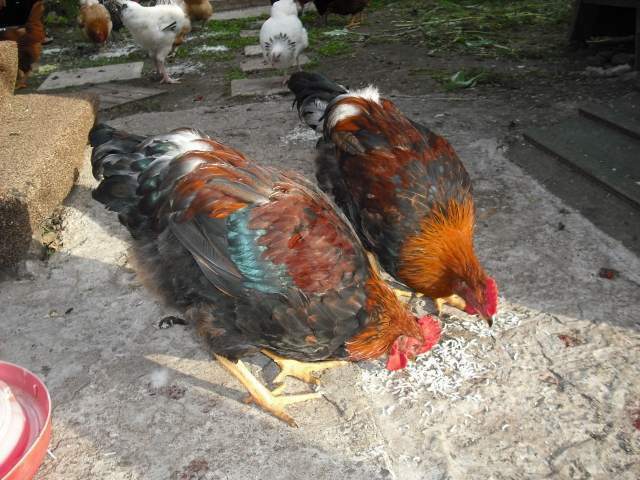 End of June 2009: We succeed to give one cockerel (Cuckoo Marans) and have to cull 4 other (2 RIR & 2 Cuckoo Marans). 20th of July 2009: We cull 3 cockerels - Frankie, Che and Zeus. 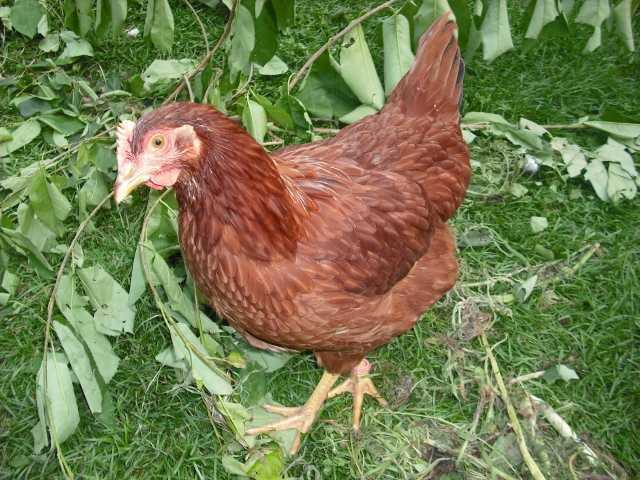 24th of July 2009: Pamela is found dead in one of the nesting boxes. Cause of death: yolk peritonitis. 4th of August 2009: Fate in the guise of a heavy wooden fence takes Zina away from us. On a happier note, we get 12 meat cockerels. 5th of August 2009: Pierre builds a new medium-size coop to house our 12 three week old meat cockerels (Shaver Redbro). 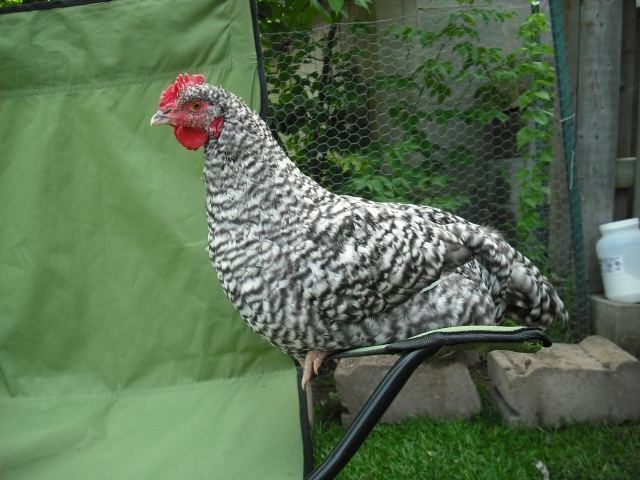 20th of August 2009: Victoria is positively identified - she is a Catalan pullet! 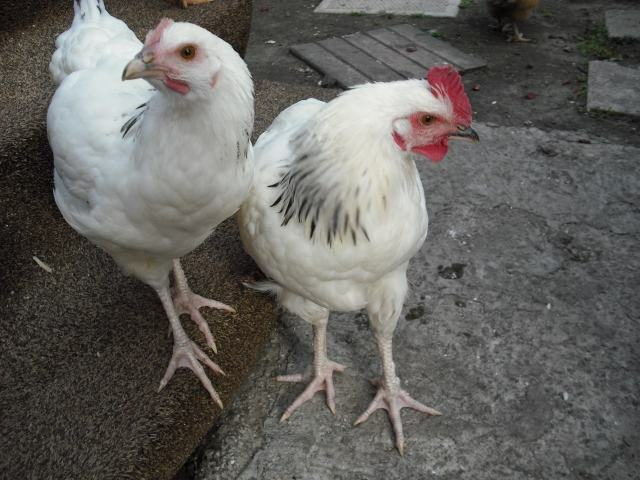 Our pullets are exactly 20 weeks old. 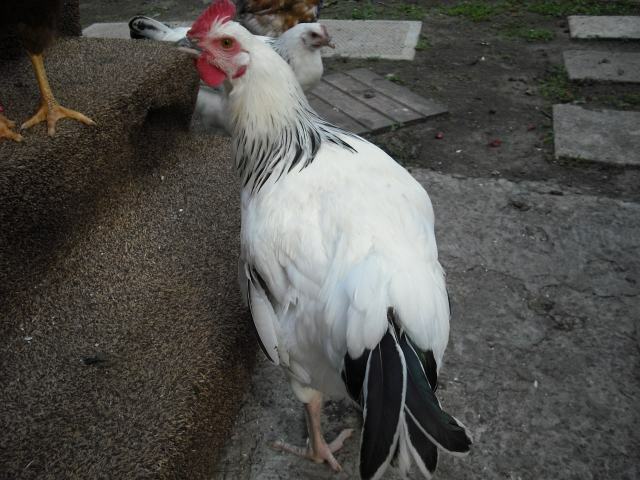 21st of August 2009: Pache is left in the care of the owners of our feed store, who have promised to find him a new home. 22nd of August 2009: Integration night! We put away the chicken tractor and bring the pullets to sleep with the hens in the main coop. Well we hope that you have enjoyed our presentation. Our greatest wish is that the general public becomes aware that these birds are intelligent creatures, with a complex social life and distinctive personalities, so that more and more people raise their voices against the inhumane treatment of the poor battery hens. 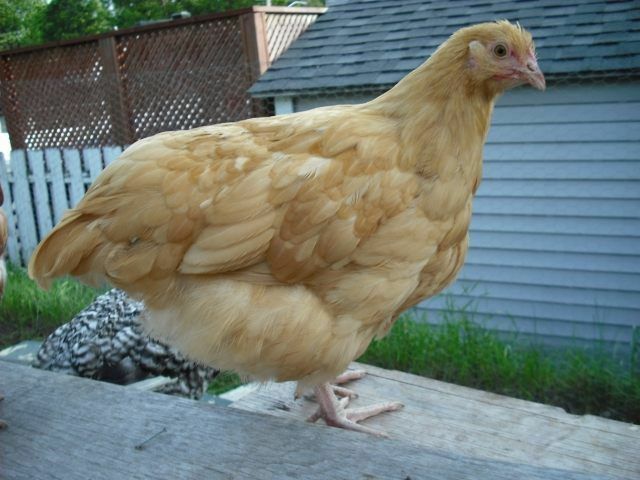 We think a website like BackyardChickens.com goes a long way in that direction. 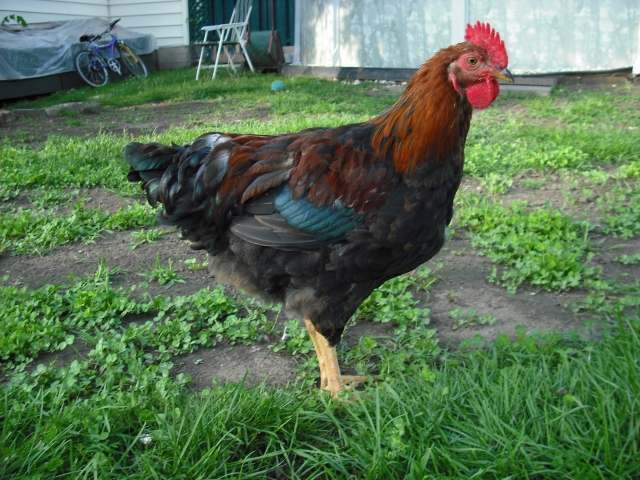 We will try to keep this page always up-to-date, as some birds will inevitably have to go and some other will eventually join our flock (we were thinking of getting pullets of the following breeds to complete our troup of layers: Cuckoo Maran, Silver-Laced Wyandotte, Gold-Laced Wyandotte, Barnevelder, Welsummer, Speckled Sussex, Ameraucana and Black Australorp).